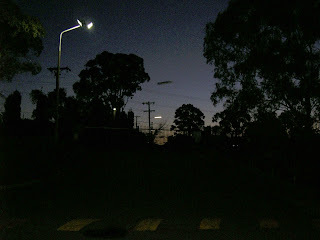 Early Sunday evening January 7th 2007 , a security guard at a factory in Baulkham Hills, a north west suburb of Sydney captured a UFO with a digital camera. James ___ has 31 years experience in security work and had been working at this factory site for a number of years. At around 7.40 pm local daylight saving time it was dusk with the diminishing light evident on the horizon. He was in the entrance security office which is situation on the entry road immediately inside the factory gate. The gate was closed. James had looked to the south - the entry gate direction and saw a clear sky. 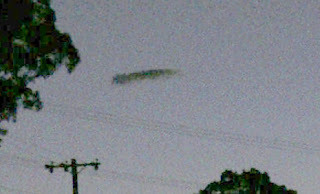 After looking away for about 5 seconds he was surprised to see a "long black thing" in the sky just above the powerlines. It seemed to have a grey halo or cloud around it. As the object seemed to be moving towards his position James grabbed his digital camera - A Pentax Optio 3.3 mp 3x200m Pentax lens - and walked outside the office. He could see that there appeared to be a cloudy light inside the halo moving from end to end across the top surface of the black shape. He got the impression that there was like a heat haze simmering effect. James took one photo. Then suddenly the object seemed to go in reverse, approximately along the light of sight, decreasing in apparent size and within about 3 seconds had disappeared from view. Examining the photo James found that the image had caputured the apparent angular size of the object but had not recorded the halo effect he had observed. He sent some information to some internet UFO sites, and Anthony Clarke of UFO Research (NSW) alerted me to the incident. I was particularly interested because the object had seemingly shown movements witnessed in an event I was investigating from January 26th (details of this later event will be posted on this site shortly). I spoke with James on February 1st and conducted an on site interview with him later that day. The incident is unexplained at this stage of the investigation, and despite his experience with the location and the night sky James is unable to reconcile the strange object with any known source. He gave me permission to put the photo up on my site. The image is copyright to James __ . I have included a lighter copy of the image, a close up of the image (adjusted to enhance some differences that are apparent on the object image), and a drawing James did for on site. Image Copyright James _____ Investigated by Bill Chalker UFO Investigation Centre (UFOIC).